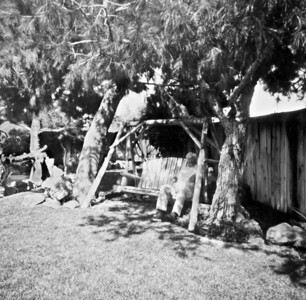 The Santa Barbara 4x5 wooden camera is a very simple box camera. It comes in three different focal lengths. I have the widest angle. For these shots I used "paper negatives". 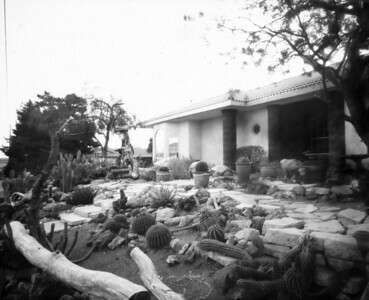 This is using darkroom photo-sensitive paper as the negative material instead of film. 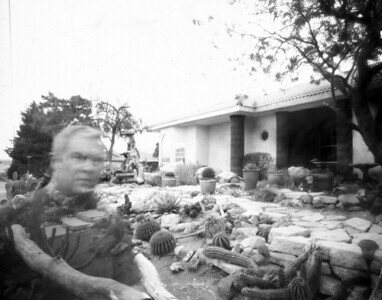 It is a lot easier to work with and is well adapted to pinhole. The paper I used was over a decade old, but had been refrigerated. It appears to have a film speed of about ISO 8. 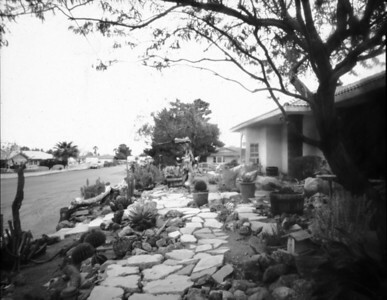 The negatives were processed in Dektol and Kodak Rapid Fix chemistry, washed, dried and scanned. .
Front Yard with Ghost - This effect is achieved by being in the image for about three quarters of the exposure time. The total exposure for this image was about 40 seconds. The ghost was in the image for about 30 seconds.